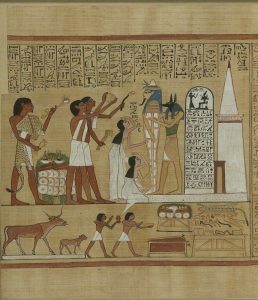 The ancient Egypt book of the Dead Spells is not exactly a book. It can be said to be just a different name for a bunch of different magical spells written down in various ways by the ancient Egyptians. The earliest known versions date from the 16th century BC during the 18th Dynasty (ca. 1580 BC-1350 BC). It boasts of partial incorporation of two previous collections of Egyptian religious literature, known as the Coffin Texts (ca. 2000 BC) and the Pyramid Texts (ca. 2600 BC-2300 BC), both of which were eventually superseded by the Book of the Dead. Safely reaching the afterlife was something all Egyptians wanted. It was believed that the afterlife was a real place, and they believed magical spells would help them get there. 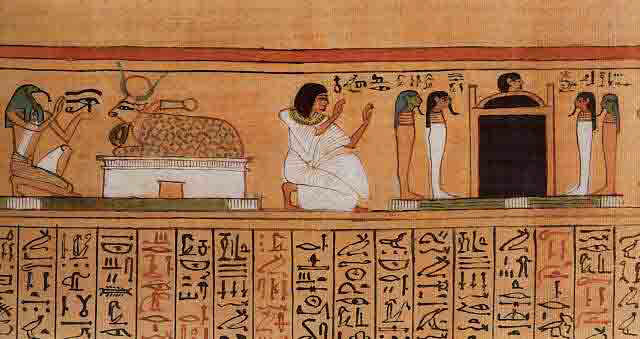 Spells or enchantments vary in distinctive ways between the texts of differing “mummies” or sarcophagi, depending on the prominence and other class factors of the deceased. Books of the Dead constituted as a collection of spells, charms, passwords, numbers and magical formulas for the use of the deceased in the afterlife. This described many of the basic tenets of Egyptian mythology. It also incorporated Magic Spells relating to the safety of the heart and soul of the deceased and also included a spell to open the tomb for the soul and to let a man return to see his house on earth. The spells in the book were written to guide the dead through the various trials afterlife that they would have to cross before reaching the underworld. It was essential to have knowledge of the appropriate spells achieve happiness after death. The magic spell 156 from the Book of the Dead relates to the power of the Goddess Isis and was recited over a knot amulet made of red jasper which was placed over the heart on the body of the deceased for protection against wickedness, sometimes referred to as the Isis Amulet.